A small hotel may have all the charm in the world, yet what the discerning guest will sometimes miss is the variety of experience to make the holiday an unforgettable pleasure. 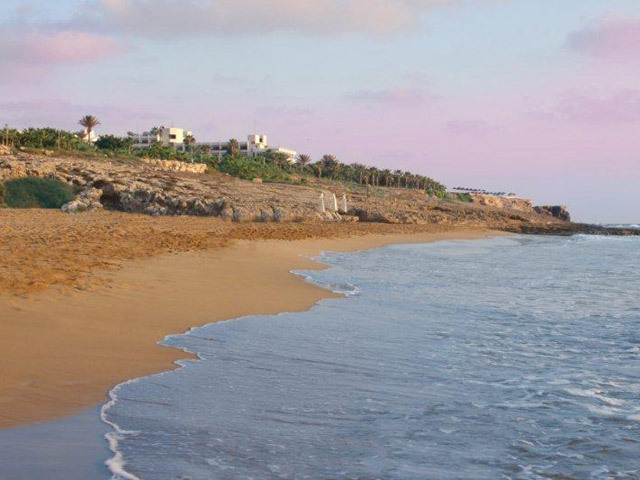 This is the thinking behind the concept of the Azia Resort, a foray into sophisticated escapism that offers stylish barefoot living, understated luxury and casual unobtrusive service. Built as three different hotels on adjacent grounds, with plethora of magnificent spaces for carefree living, the Azia Resort has all the diversity to keep its guests contented for a week or longer. Each element of the three-in-one boutique hotel concept has its own character and fulfils different aspirations of the visitor. The Azia Blue is about sophisticated, spacious living and family luxury. 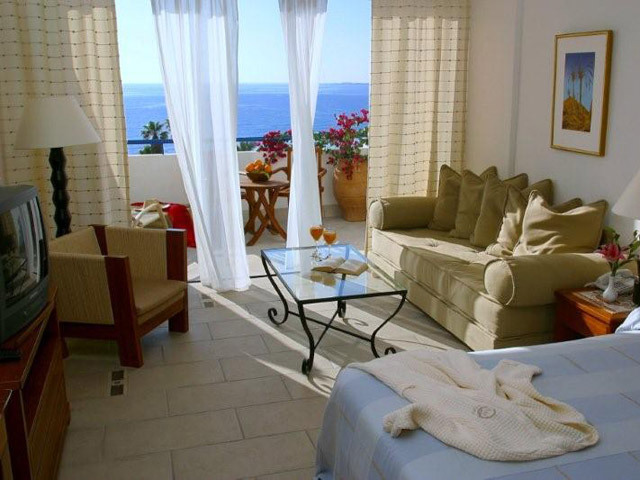 The Azia Club and Spa is ideal for privacy and indulgence. 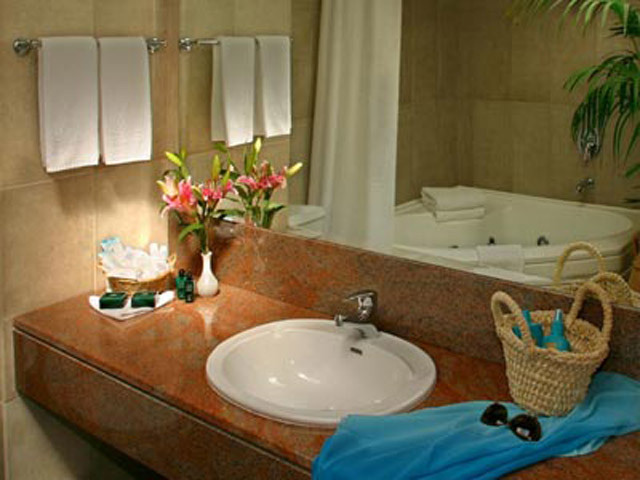 The Residence is a haven of individual pampering and innovative style. The sophisticated design of the trio owes as much to edgy London design as to local influences. The nature is suggested, for instance, by such details as the use of flower and leaf motifs carved on wood and stone as well as by the profusion of indoor and outdoor plantings. The history is present in a slick, fusion manner combining very earthy and artistic elements. 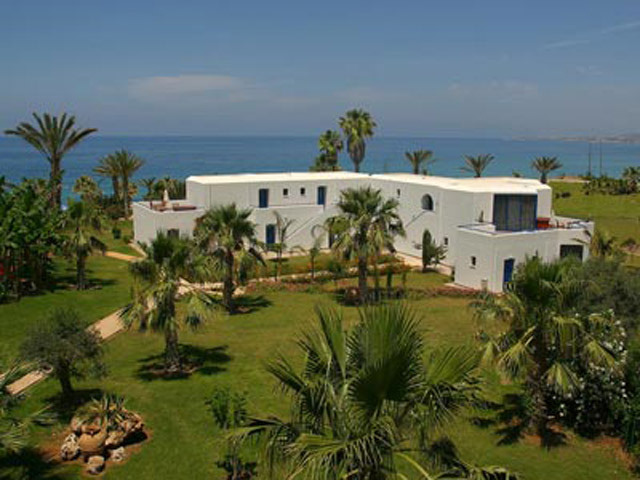 Each area is influenced by a different chapter of the Cyprus history. Venetian Murano glass, hand painted silk and gold leaf decoration of the main dining room represent the impact of the Venetian Republic on the history of the island, while the main lobby has the airiness suggestive of the open spaces of the agora of ancient Greece. There the pebble, the marble, the greenery and the abundance of light combine perfectly with lounge loveseats and design furniture. The staircase banister looks like seaweeds moving with the waves and the piano lobby bar is a beautiful reminder of the colonial influence. 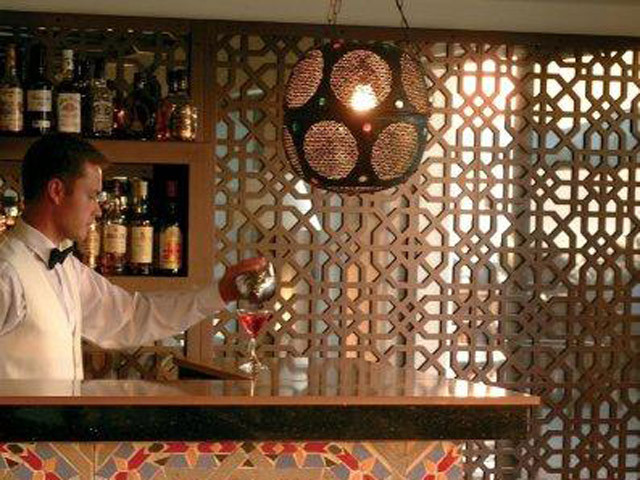 The main bar, in deep sensuous colours, with finely carved wood lace on the walls and hand-wrought iron lamp structures, captures the fusion of Arab cultures on the island. The sybaritic Asphodel Spa is a hymn to nature, intriguing to the senses yet calming to the mind. 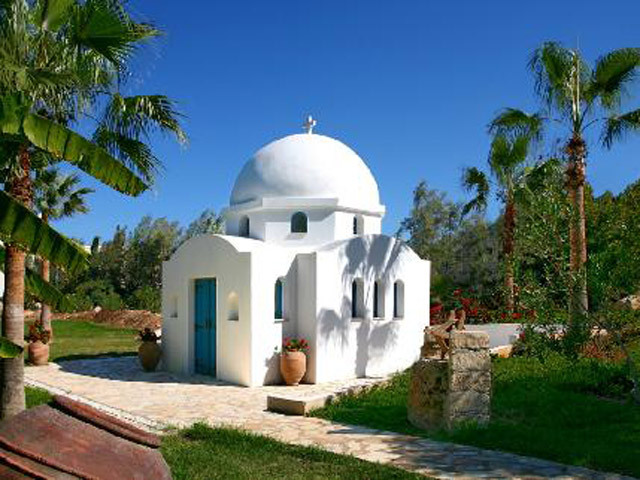 The sound of falling water, the fine incense of ouzo and anise, the breeze in the garden treatment rooms, the rich natural textures; these and a variety of treatments offering different experiences have been deployed in its design to awake all the senses and sooth the body and mind. This is one of the best spas in the world, a space that can keep the visitor content day after day. 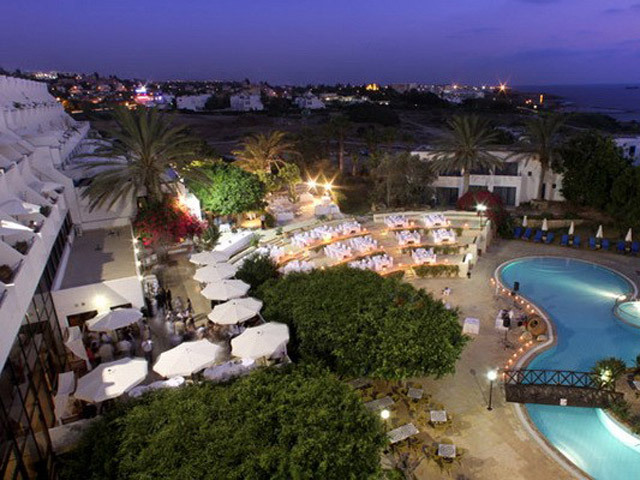 The symbol of the hotel is the Asphodel, the immortal flower in the ancient Greek mythology. According to the ancient Greeks, it stands for the ultimate happiness of the soul and was the first sight a soul longed to see at the gates of paradise. Asphodel still grows in abundance wild on the island. 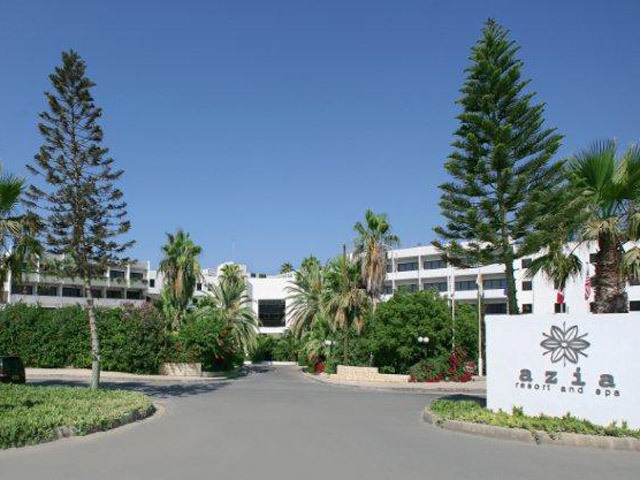 Situated a few miles from Paphos town centre, the hotel is privileged to share a close proximity to the finest monuments and treasures of the island. 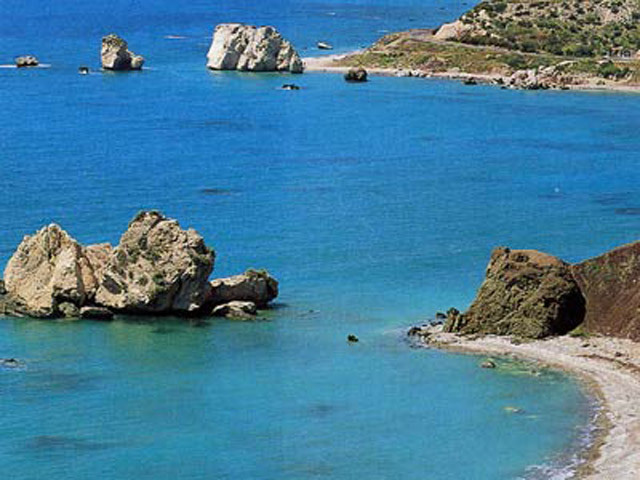 Paphos is a picturesque location, thought to be one of the most desirable on the shores of the Mediterranean. Home to the legendary mosaics at the House of Dionysos, and birthplace of the goddess Aphrodite, this distinguished town is rich in the history and architecture of Ancient Greece, and is blessed with a people of genuine warmth. Blue: 183 Rooms and Suites. Sophisticated, spacious living and family luxury. Club and Spa: 81 Rooms and Suites. Privacy and Indulgence. The Residence: 35 Suites. A haven of individual pampering and innovative style. 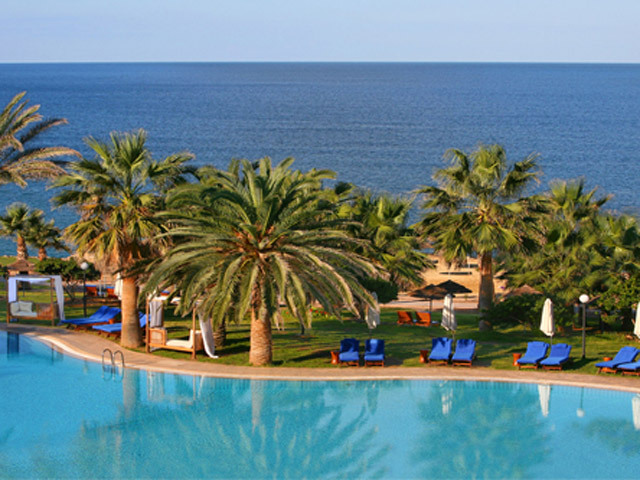 The Azia Resort offers luxury as standard. Twin-bedded rooms, ensuite bathroom, mini bar, satellite television, central music system, hairdryer, telephones in bedroom & bathroom, air-conditioning, central heating, safe deposit box and smoke detectors. 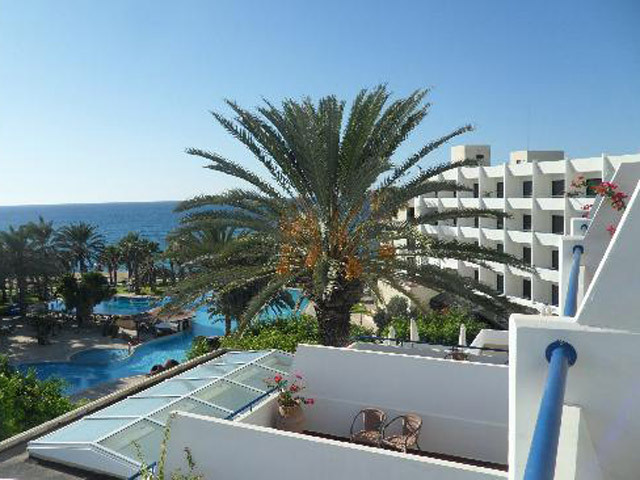 Rooms and facilities for disabled guests, sun terrace rooms with private sunbathing facilities, larger superior rooms with a private garden or terrace, family rooms and non-smoking rooms are also available. All the children staying at the Club and Spa get a shoulder relaxer massage at the Spa Free. 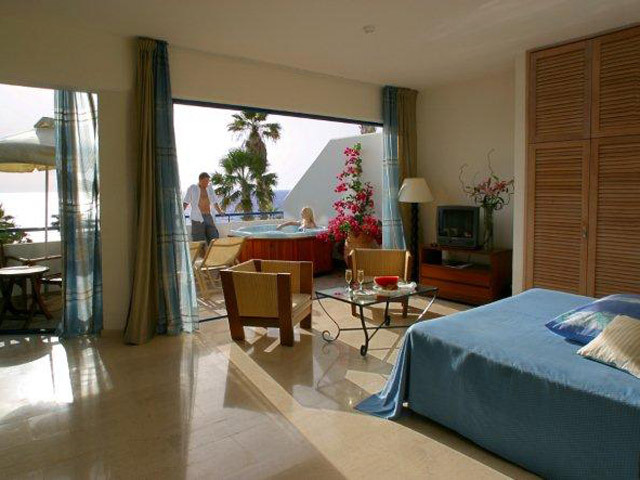 Superior Rooms Sea View: Superior rooms have large balcony or Terrace with sun beds and umbrellas and are suitable for sunbathing. 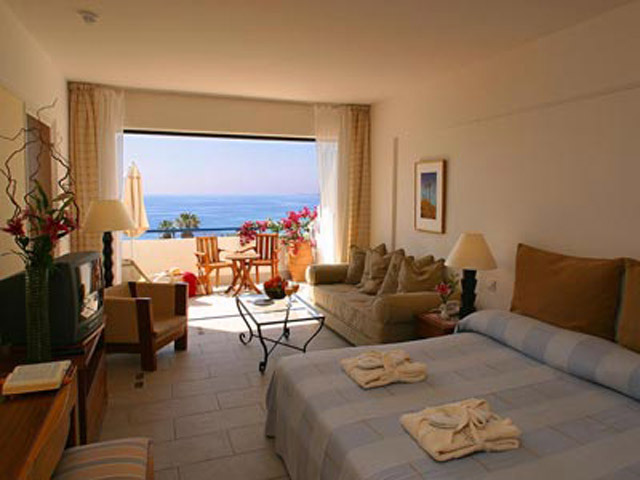 They are all full sea view rooms. Max. Occupancy. 4 persons. 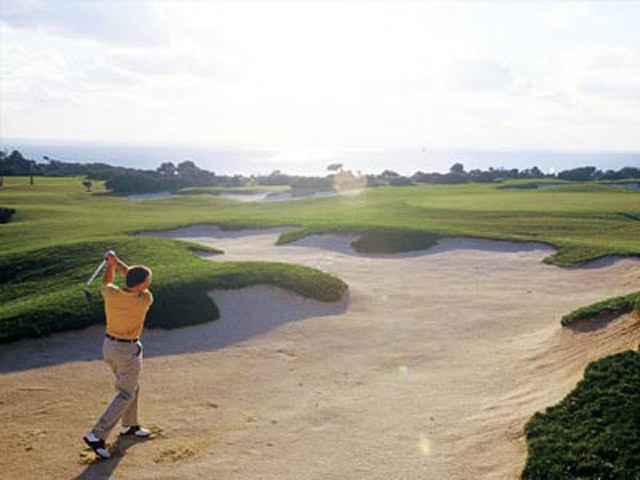 Golf & Water Sports : Three 18 hole golf courses, all within 30 kilometers of the hotel and a range of water sports including: Scuba Diving, Windsurfing, Water Skiing and Paragliding, can be booked at the hotel's reception. 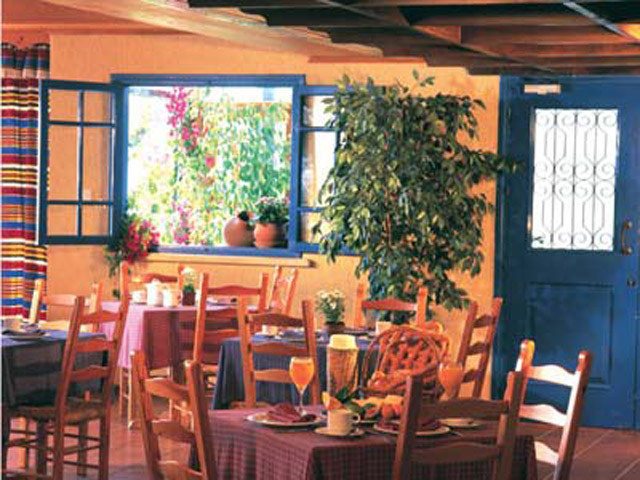 Akamas Restaurant : A'la Carte, Table d' hote and theme buffets on the garden terrace. Katoi Restaurant : Buffet breakfast, A' la Carte lunch menu and special theme evenings. 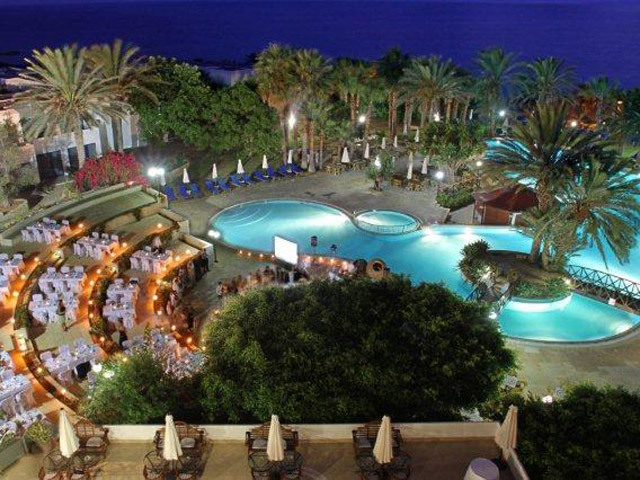 Amphitheatre: Dine alfresco by candlelight, overlooking the sea -weather permitting. Cava Bar : Open throughout the day and evening, offering morning pastries, drinks, light snacks, cocktails and afternoon tea. Live classical music performances most afternoons and live entertainment most evenings. Cipro : A'la Carte, Table d' hote and buffets in the exquisite marble conservatory. A fusion of Mediterranean cuisines. Cubes Garden Restaurant : The finest international cuisine in a beautiful conservatory. 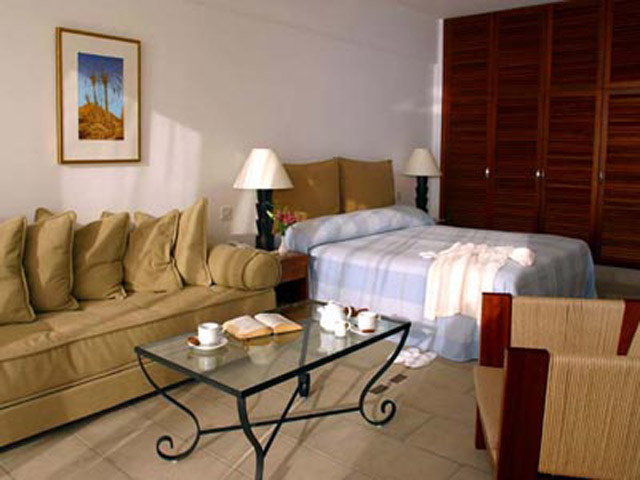 The Above Special Discounted Rates are inclusive of all taxes, services and Breakfast. and 2 BEdroom Suites. One child (0-12) FREE in other room types. 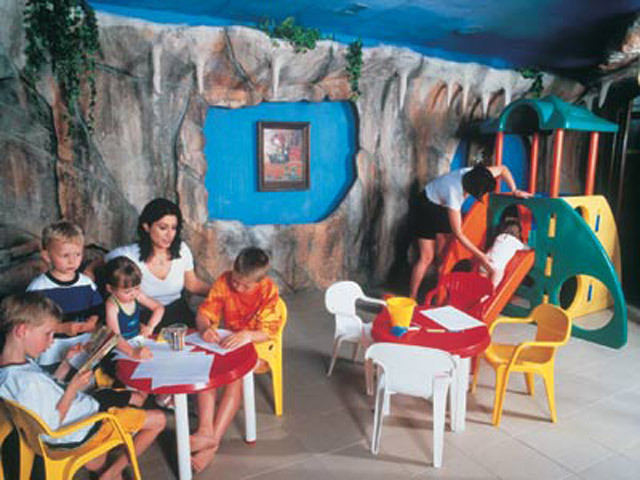 - Extra Room for Children : Children 0-18 years old occupying their own room ( minimum 2 children ) get 20% discount on the adult BB Rate and 50% discount on extra terms. Cancellation Policy: if cancelled 3 days or more before arrival, no fee is charged. If cancelled 3 days or less before arrival, 1 night cancellation policy. In case of no show, full stay is charged. the lobby and pool area was great but as soon as we entered our room we were disappointed. old furniture ancient tv set, two single beds united were the 'double' bed even though we asked specifically for a double. smelly carpet probably 20 years old. the food was average and highly not a value for money. 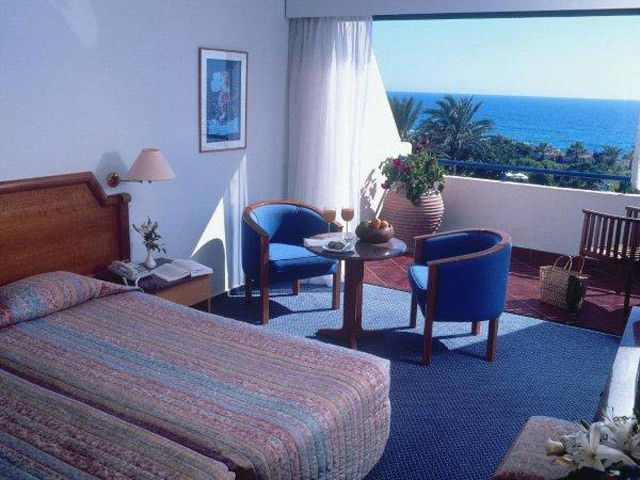 We were also told that your company hasnt settled the accomodation fees and its a pity to pay it again -exact words-!!!! unacceptable. they didnt even asked an apologise afterwards just a notice under the door that confirmed the payment. The TOP was on our departure at 12pm we asked if its ok to stay at the pool until the evening which is the usual i believe and the answer was :you cant stay nowhere at the hotel and must leave now because a group of UN soldiers came and all guests must go because its not allowed.Just like that not even a prior notice!! Ridiculous and shocking!! I DONT RECOMMEND IT TO ANYONE. 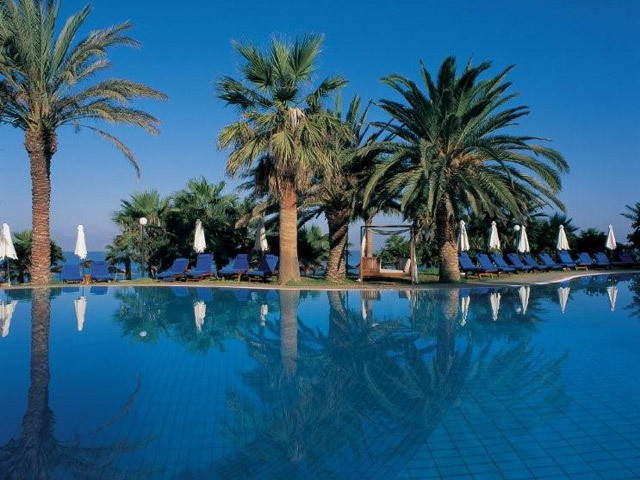 The hotel's large lagoon type swimming pool is its strongest asset. 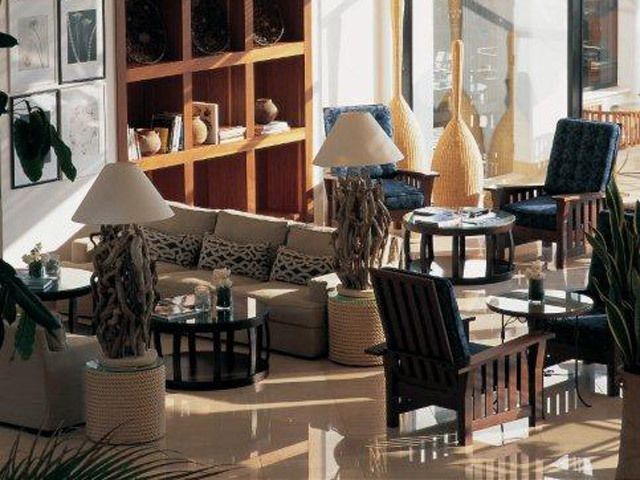 Although the lobby and bar area are beautifully decorated, the rooms and garden area could do with a makeover. The food was very tasteful, although we were expecting a larger variety at dinner, as this is a 5 star hotel. Also, there was no special menu for kids, which was also a disappointment. This is not a 5* Deluxe hotel for sure. There are no additional facilities or services from a 3* hotel. I could easily find the same services and quality to a 3* hotel. Except if you book a premium room which is equal to a standard room from a 5 Deluxe hotel. We really dissapointed in overall. At least there was professionals in the management who actually understood our problems and our dissapointment and they upgrated us to a premium room services. Otherwise there was not a reason to stay in a hotel which has been advirtised as 5* Deluxe hotel but actually it is not. I am not sure based on which criteria and which process you are adding a hotel in your group but you need to be sure what you are advirtising.